So nice, you gotta die twice! Ok, we know it would be hard, but we didn’t expect it to be HARD. 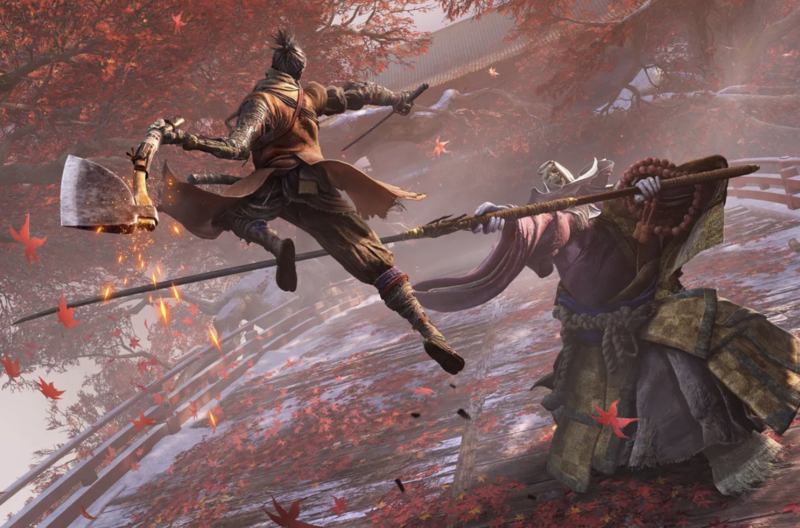 FromSoftware’s latest offering, named Sekiro Shadows Die Twice, takes a stab at the tried and tested Souls formula and adds some little twists here and there to make it familiar but seemingly identifiable as a game that can stand on its own merits. We had a chance to test the game during Tokyo Game Show 2018 and during the brief session we had, we’re proud to say that we died a lot of times (6!) 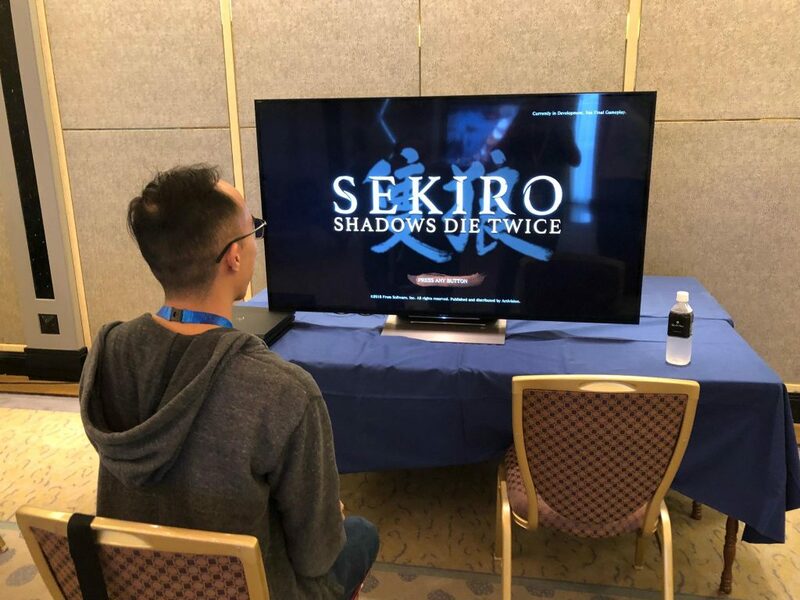 but also walked away from the impression that Sekiro is a title that plays as good as it looks. And HARD as balls. The demo started us off with our protagonist atop a tree, which is most likely where you’ll be spending a lot of your time since you’ll have to choose your battles wisely. Similar to Souls titles, strategy is the name of the game and it would be foolish to take on multiple opponents at the same time. As we drop off from the tree to execute the hapless victim below, we immediately notice the posture mechanic of the game. “Posture’ seems to be somewhat like a meter that you can take advantage of – fill up the opponents meter and you successfully “break” their posture, allowing you to inflict more damage or even go in for the killing blow. You fill up their Posture meter by attacking them in quick and successive fashion, if you give an opponent time to breathe, their meter depletes back to zero. You’ll need to fully take advantage of this to make battles go your way rather easily because the longer the battles go, there will be more chances for error and death. Another thing you will immediately notice while playing the game is the very fast pace and movement of the character. We don’t quite know if it is due to his upgraded equipment or skills but the character we were playing with moved around the battlefield very fast, a far cry from the Souls game that you’re used to. This allows for more exciting and thrilling battles but it also allows for careless mistakes like suddenly dodging away from harm only to fall into the cliffs below. Pace is a very important game design aspect in Sekiro, but positioning is equally as important and it is quite fun to actually jump / dodge in this game that gives it a whole new level of verticality instead of just moving from left to right. You’ll have a grappling hook as a tool to traverse ledges and trees so this tool will be your best friend once you start the game. Unless you’re skills are god level SSS class player, you’ll eventually die in the game, but don’t worry because dying will only teach you to git gud. Dying here works differently from the other souls titles, at least from the build that we played. Upon first death, you will be asked to resurrect if you choose to continue the battle, hence the monicker “Shadows Die Twice”. It’s a novel idea, one that adds a bit of flavor and pace to the whole game. As mentioned, pace is a very important aspect and this way, you get to keep the momentum of the fight by taking a crack at the encounter immediately. Skill can get you places but our protagonist is “arm”ed with a prosthetic… well, arm, that he can use against the opponents. This prosthetic can either be a second melee weapon, a fire based attack, throwing shurikens at range, etc. Some enemies are weak to certain prosthetics, like a shield based enemy being able to block almost every attack you can throw at it but if you use your axe prosthetic to break the shield, then you can easily put the encounter in your favor. These prosthetic tools will be vital to your survival in the game and it is up to you to figure out what tools will allow you to breeze through and make your life easier. People have mentioned that Sekiro is the spiritual successor to Tenchu and from what I’ve seen, it can and can’t be compared to Tenchu? It’s a bit complicated. Tenchu focuses on a very stealthy aspect of the game and while you may choose to approach Sekiro the same way, it is definitely not the only way to go about the game. Sekiro offers the players the feeling of being a highly skilled shinobi warrior, and it is within your means to either go head on into a fight or search for the best way and strategize your approach. Some encounters will favor other means, but it is in this offering of choice where Sekiro shines. I guess the best way to really say it is that it is and it isn’t Tenchu, at the same time? The biggest difference here is that there is probably no way to go through a whole level via stealth, and I may be proven wrong once the final version comes out. Another glaring thing that we noticed is the lack of multiplayer which is an integral part to the whole Souls experience. 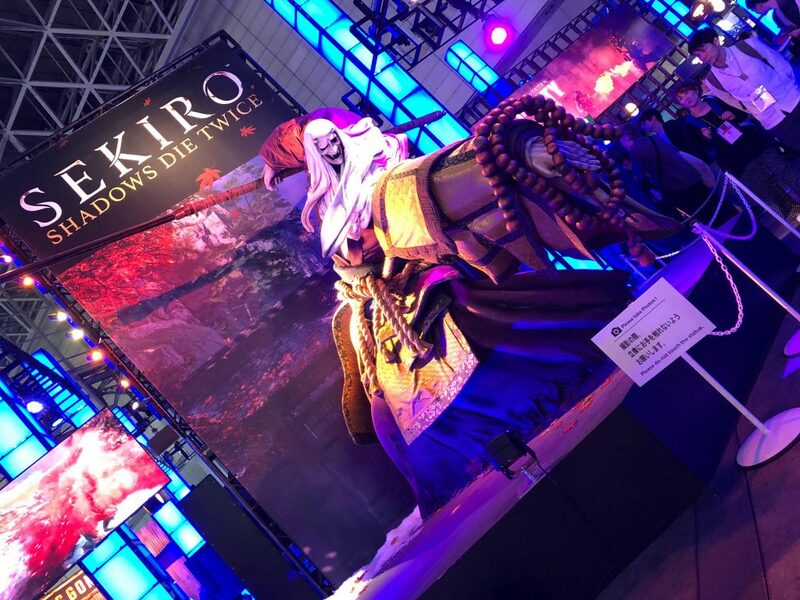 For Sekiro, it was more of design decision to veer away from the multiplayer aspect and in turn, focus all of their available resources into a single player campaign that is full of content and of a quality that players can be happy about. With this said, the campaign length will take you around 20-30 hours to complete, give or take. Sekiro Shadows Die Twice is currently slated for a March 22, 2019 release for the PS4, Xbox, and PC as published by Activision and developed by FromSoftware.